18 WEYER 501 BB DTR OF GFL 642-2012 G/SON OF DOUBLE "MONA LISA" WITH "AVIATOR" & "ROCKET" 1ST NAT'L ACE ALL HOLLAND, WON 1ST PRIZES AT ALL DIST. RACES VS THOUSANDS WINNING 4 YEARS IN A ROW. 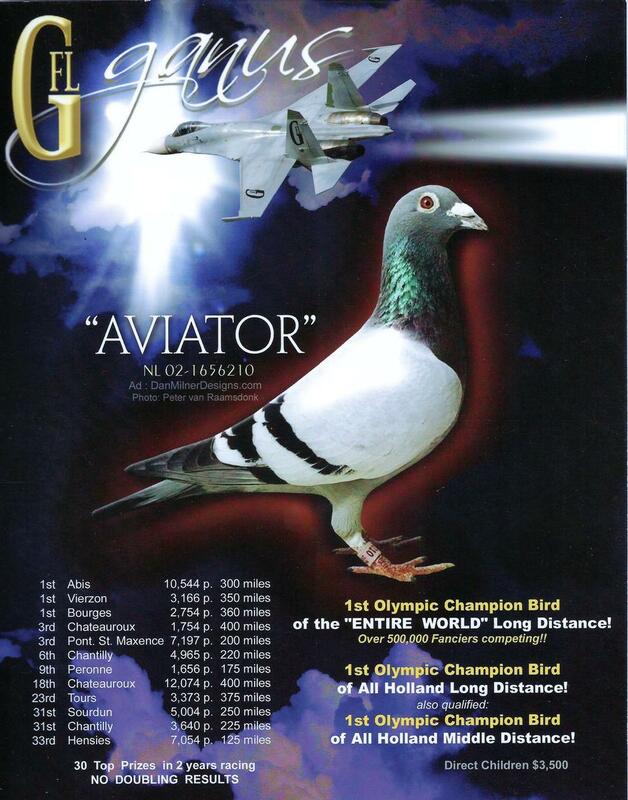 "AVIATOR" 1ST OLYMPIC CHAMPION OF ALL HOLLAND L/DIST CHAMP OF THE ENTIRE WORLD! VS 50,000. OFF "SUPER CRACK" .SON OF NL-1518441-97 1ST N.P.O. BOURGES. 1ST VS 10,836B. & "SPRINGER". "GOLDEN DULVEN" DTR OF "SOLO II" SON OF "UNO" 1ST NAT'L BOURGES. "MONA LISA"OFF "THE PHANTOM" & “MEMORIES" N/SISTER TO DAM OF "CREATOR". "MONA LISA" MY BEST HEN EVER!! QUOTE OF MIKE GANUS. "THE PHANTOM" ONE OF THE GREATEST FANICERS OF ALL TIME. QUOTE OF MIKE GANUS" A SUPER BREEDING MALE BRED BY FLOR VERVOORT OF BELGIUM. "ROCKET"1ST NAT'L ACE ALL HOLLAND-OLD BIRDS N.P.O. 1999. WON 1ST PRIZES AT S/M/L DIST RACES VS THOUSANDS 4 YRS IN A ROW. 4 F/BRO & 5 D/SONS ALL 1ST PRIZE WINNERS. HIS DAM NL 8885905-88 WAS A CAR WINNER. 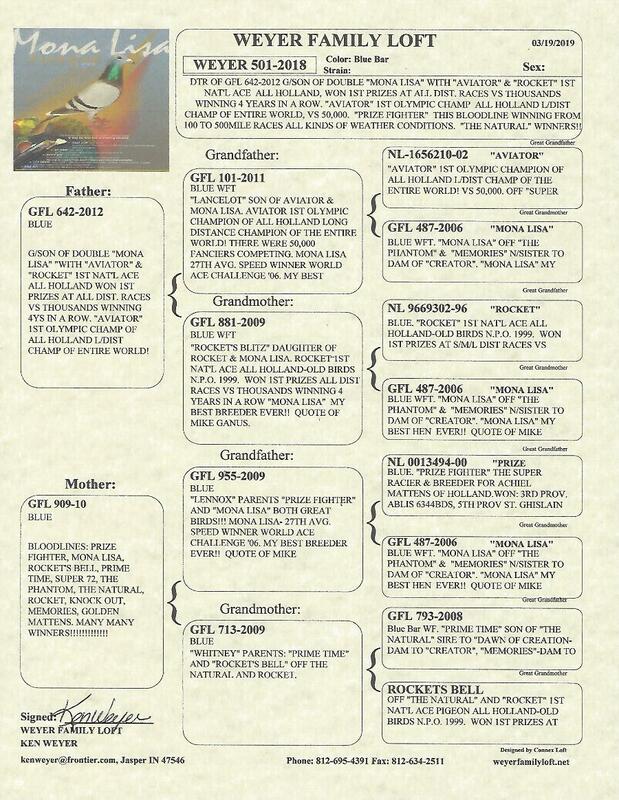 HIS SIRE "SUPER RACER" THE ROCKET'S FAMILY IS THE OLD TOURNIER BLOODLINE. THE "ROCKET" IS A TRUE CHAMPION RACER & PROVEN BREEDER OF WINNERS. QUOTE MIKE GANUS. 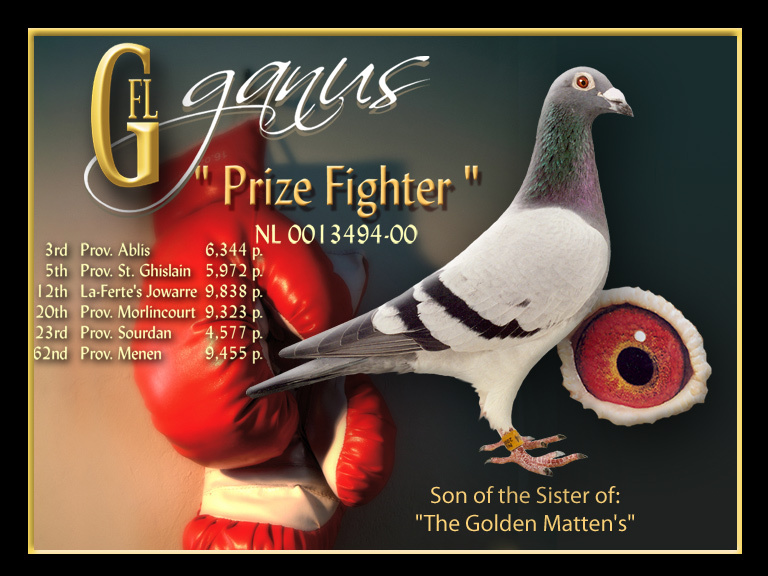 "PRIZE FIGHTER" THE SUPER RACIER & BREEDER FOR ACHIEL MATTENS OF HOLLAND.WON: 3RD PROV. ABLIS 6344BDS, 5TH PROV ST. GHISLAIN 5972BDS, 12TH PROV LA-FEWRTE'S JOWARRE 9838BDS. ETC. THIS BLOODLINE WINNING FROM 100 TO 500MILE RACES ALL KINDS OF WEATHER CONDITIONS. 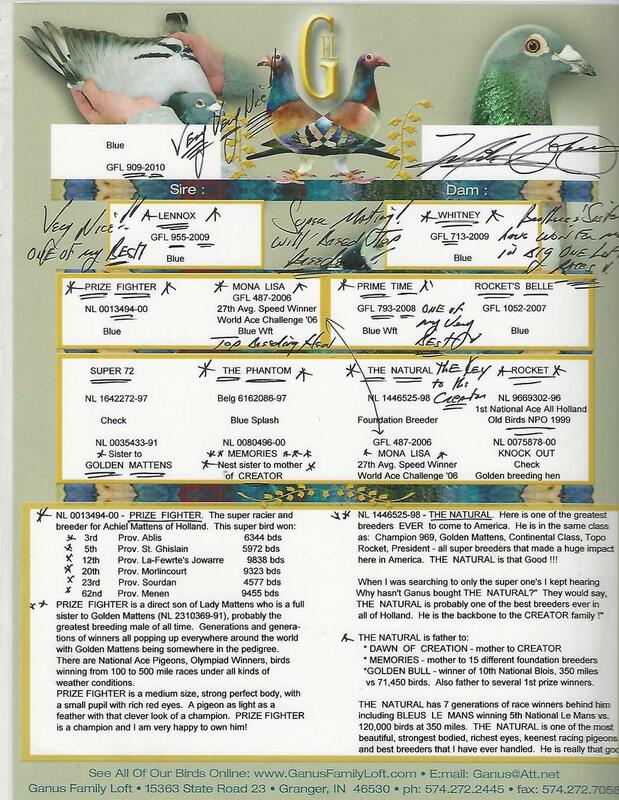 GFL 793-2008 SON OF "THE NATURAL" SIRE TO "DAWN OF CREATION- DAM TO "CREATOR", "MEMORIES"-DAM TO 15 DIFF F/BREEDERS, "GOLDEN BULL- WINNER OF 10TH NAT'L BLOIS, 350M VS 71,450BDS. ALSO SIRE TO SEVERAL 1ST PRIZE WINNERS. & MONA LISA-27TH AVG. SPEED WINNER WORLD ACE CHALLENGE '06. 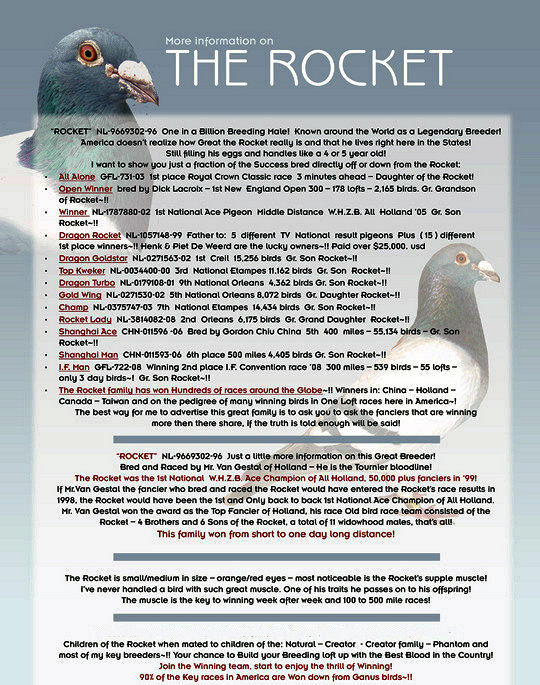 “ROCKETS BELL” OFF "THE NATURAL" AND "ROCKET" 1ST NAT'L ACE PIGEON ALL HOLLAND-OLD BIRDS N.P.O. 1999. WON 1ST PRIZES AT S/M/L DIST RACES VS THOUSANDS 4 YRS IN A ROW. 4 F/BRO & 5 D/SONS ALL 1ST PRIZE WINNERS. HIS DAM NL 8885905-88 WAS A CAR WINNER. HIS SIRE "SUPER RACER" THE ROCKET'S FAMILY IS THE OLD TOURNIER BLOODLINE. THE ROCKET IS A TRUE CHAMPION RACER & PROVEN BREEDER OF WINNERS. QUOTE MIKE GANUS.